For some, they are important aids in the daily routine, but for others, they are ominous surveillance tools. They are integrated into bracelets and glasses, or downloaded as apps into our smartphones. They measure, store and locate our personal data. 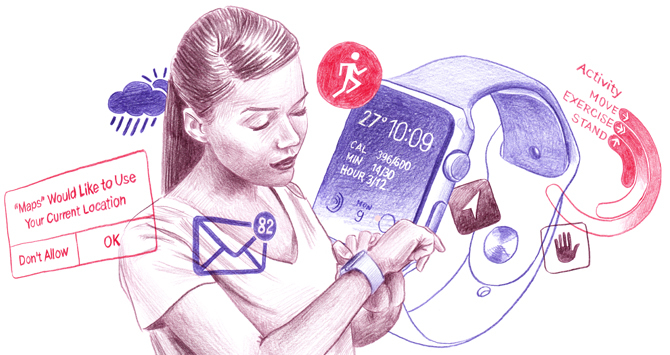 Wearables – minicomputers hidden in our apparel – are conquering new territories – step by step – in our daily lives. For our benefit? Two points of view. "Evaluation of the overall data can contribute to more health-conscious behaviour", says Andreas Oberweis, chairman of the FZI Forschungszentrum Informatik und Vizepräsident der Gesellschaft für Informatik e.V. Good things come in small packages: wearables – or more specifically wearable computers – are miniaturised computers that people can wear on their body. They are integrated into a bracelet or a wristwatch, connected to a pair of glasses, sewn into clothing, built into shoes or hidden in an earring. And they combine numerous functions there, such as timekeeping, photography, audio and video recording, access to email and social media, telephone calling or navigation. Through sensors, they can enable the measurement of body functions such as with a pacemaker, a pulse monitor or a temperature sensor. Even though they are small, their benefits are numerous. Evaluation of the overall data can contribute to more health-conscious behaviour for the wearer of the device (through the calculation of caloric requirements), or playfully inspire him to initiate sporting activities. Wearables can be used as convenient car and front-door keys, as digital tickets or for paying without cash. Furthermore, they store personal data as well, for health, for example, so that they are quickly accessible to doctors if necessary. In the best-case scenario, they can become lifesavers. Since they are frequently perceived as practical fashion accessories instead of technological devices, the acceptance threshold is low for many individuals. Even applications in business enterprises are conceivable, such as for access to and control of software or office equipment. By providing special operating systems for wearables, completely new possibilities have been opened up for programmers who can develop and sell apps for wearables. Several online marketplaces for such apps have already emerged. Analysis of data that can be collected by wearables can be used to manage crowd volumes at large events, or even to plan rescue operations or disasters. Secure handling of highly-sensitive data that are collected through wearables is certainly a challenge, and not only in technical terms; it is also difficult with respect to users’ corresponding increasing awareness. From an economic standpoint, however, the tiny “all-rounders” possess huge market potential in that they will become – in certain manifestations – ubiquitous and indispensible components of our future lifestyles. "Biosignals can also indicate how valuable an employee is and how far his commitment to the company goes", says Jörn Müller-Quade, Professor for cryptography and security at the Karlsruher Institut für Technologie and spokesperson for the national Kompetenzzentrum für Cybersecurity "KASTEL". Even George Orwell could never have thought up something like this: human beings wearing bracelets that have all of the functions of a lie detector. Not only communication, photos and video data are analysable on a massive scale, but our feelings, our health condition and our performance capacity are also quantifiable. The objection is frequently expressed that our own data is uninteresting. But whoever claims something like that simply lacks imagination regarding how transparent we become through these sensory data, and what benefit and value they can have when they are used against us. Health data is not only interesting to insurance companies. Biosignals also show how valuable an employee is, how long his concentration span is, how great his performance capacity and resilience are – and how far his commitment to the company goes. Knowing the mood of our counterpart in a negotiation can be advantageous, likewise sensing a change in the mood of a firm’s board, with the staff, or with entire branches are valuable pieces of information for competitors. By correlating the sensory data from the heart rate, blood pressure or tremors with the way a person appears or sounds, one can deduce personality profiles that can look beyond the façade deeper than the closest friend. As long as the interpretation of the data collected is the basis of the business model for powerful firms who are in a position to influence consumer behaviour, or nations are able to use these data to outsmart our politicians in negotiations, I can imagine a huge threat from the indiscriminate use of wearables. This is of course in conflict with the advantages that wearables represent. They facilitate, for example, a healthy lifestyle and enable early recognition of health problems. When linked to an emergency phone call function, they can even save lives. But Germany and freedom of information are invariably positioned for a conflict regarding the benefits of this evaluation of data on a massive scale. Solving this contradiction, I think, is one of the huge challenges facing our society. For this purpose, we need better cybersecurity, novel procedures of analysis that still respect data protection and legal limitations on the use of data. But we also need new business models. Hard-won civil liberties should not be surrendered so easily.